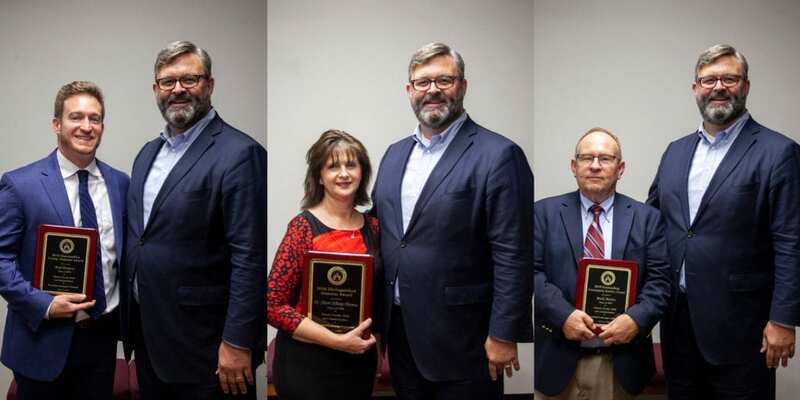 Hannibal-LaGrange University recognized the annual alumni award winners during the 2018 Homecoming Entertainment on Friday, October 6. The Distinguished Alumnus Award was presented to Dr. Sherri Elliott-Thomas ‘86. This award is presented to an HLGU graduate for significant and broad accomplishments in business or professional life, or for state or nation. Born in Chillicothe, MO, Sherri attended Meadville R-IV High School before receiving a Bachelor of Science in Education from HLGU in 1986. She then earned a master’s degree from Truman University, an education specialist degree from Union University, and an educational doctorate degree from William Woods University. Sherri served as a middle school teacher in Hannibal, Wentzville, and in Jackson, TN. She then served as an assistant principal at Rolla Middle School, and as principal at Lewis and Clark Middle School in Jefferson City. Sherri has also served as an adjunct professor at HLGU, Missouri Baptist University, Columbia College, and William Woods University. Currently she is working as a school improvement consultant for University of Missouri. Sherri has received multiple awards and honors including being a Zonta Women of Achievement Honoree for Jefferson City, Principal at Lewis and Clark Middle School when the school was recognized in Washington, D.C. for six National Promising Practice Awards, Middle School Principal of the year for the Central Region of Missouri Association of Secondary Principals, Assistant Principal of the Year and Consummate Professional from South Central Missouri Association of Secondary School Principals, and multiple Who’s Who awards and Golden Apple Award Nominations. She is a member of organizations such as Missouri Baptist Disaster Relief, National Association of Secondary Principals, Phi Delta Kappa, Missouri Middle School Association, Community Teachers Association, Zonta and Cole County Historical Society. Dr. Thomas is dedicated to Diversity and Inclusion, and is a certified trainer through Dr. Ruby Payne, aha! Process. Sherri and her husband Kent live in Jefferson City and attend Concord Baptist Church. They have been married for 34 years and are proud parents of Caleb, Seth, and daughter in-law, Lindsey. Sherri is the daughter of Patricia and the late Robert Elliott of Meadville, MO. The Outstanding Young Alumnus Award was presented to Brad Dempsey ’05. This award is given to a Hannibal-LaGrange graduate, who is age 35 or younger, for outstanding accomplishments in their profession, business, community, state, or nation. Born in Hannibal, Dempsey received a Bachelor of Science in Psychology from HLGU in 2005. Following graduation, Dempsey earned a Masters of Education in Athletic Administration in 2009. He currently serves as assistant principal and assistant varsity girls soccer coach at St. Dominic High School in O’Fallon, MO. He has also served as a teacher and coach at Palmyra Middle School and Monroe City Middle and High Schools, as PE teacher and athletic director at St. Joseph Cathedral in Jefferson City, and as athletic and activities director and head girls soccer coach at Helias Catholic High School. Dempsey is a member of Knights of Columbus, St. Louis Soccer Officials, Missouri Soccer Coaches, and Legends Soccer Club, and is passionate about family, faith, and friends. Dempsey and his wife Gala have two daughters, nine-year-old Alice, and seven-year-old Aubrie, and one son, three-year-old Quinn. He and his family attend Immaculate Conception Church of Dardenne Prarie. The Outstanding Service Award was presented to Mark Martin ’67. This award is given to Hannibal-LaGrange graduates who have given outstanding service to the University or their community through involvement in civic endeavors, religious leadership, or philanthropic efforts. Martin is from Traer, IA, but recently moved to an apartment on the HLGU campus so he can volunteer his time as an assistant coach for the HLGU Wrestling team. ​Following his graduation from HLGU with an associate degree, Martin went on to earn a Bachelor of Arts degree from Southwest Baptist University in 1969. He then spent 45 years working in retail management. Martin is married to his wife Marcia, and is passionate about young people and helping people be successful.